This outcry led to the formation of a coalition of county citizens, called Save Picton Town Hall (SPTH). Our mission is to preserve the hall as an outstanding public space for community use. We want to include everyone who is interested in the effort to save our hall. A public workshop was held last January [see our Facebook page] to seek ideas for the best possible uses for the hall and for viable means to continue its use as an irreplaceable community asset. Since then, our core group has met bi-weekly, sharing the work of creating a plan, communicating with the community and engaging the stakeholders, partners and potential tenants who can help make the plan a reality. SPTH Working Group members (L-R): Bev Campbell, Duncan Moore, Lynne Rochon, Lenny Epstein, Leslie Smail-Persaud and Sarah Moran [absent Margaret Watson]. We shared the draft strategic plan (funded by SPARC – Supporting Performing Arts in Rural and Remote Communities) with the community at a well attended meeting at the end of September. Now work is focussed on completing the proposal to council in response to their issuing a call for Expressions of Interest [680 kb PDF]. On this core group is a an ex-councillor, a social enterprise strategist, a community activist, a Main St. small business owner, a PEC Arts Council board director and a profit/non-profit business executive. We are assisted by advisers with key necessary skills: business planning expertise, heritage architectural expertise, legal expertise, communications expertise. 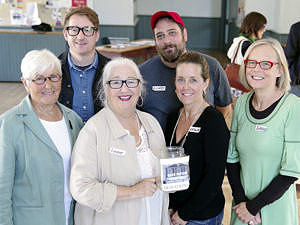 We are partnered by PELC, the Regent Theatre, PEC Library, PEC Arts Council, Branch Architects, the County Food Hub, Picton Farmers’ Market and a Food Co-op initiative. We thank you, everyone, for supporting “A Hall for All”.